I'm back home and it's very hot in the office so I'll be short. Yesterday I had an author focus group for Harlequin -- they at least know that publishers are ALWAYS behind the curve of what will be hot. Really. Authors, Readers, and Authors as Readers are usually ahead of the curve. I mean, look at HeartMate, for example. It was a VERY risky buy -- a futuristic purchased by a company (Jove) that WASN'T buying futuristics. I was very nervous and spent as much time, promotion and $$ as I could. That was 12/01. By July 2002 EVERYONE wanted paranormal. So I was submitting stuff and a tiny risk paid off. After the focus group I had lunch with my editor for Luna, then I attended the seminar on Luna and paranormal, then I met with my editor and agent for Berkley. This was a little frazzled since I was in one spot (without cell phone) and the others had decided on sitting somewhere else. Grrrrr. I don't really like these meetings. It's hard for me to strike the right note. Professional and businesslike is really too cold. But it ISN'T a friendship relationship. By that time, too, I'd had enough of people in general. Luckily my agent DOES know how to strike the right note. Both times I discussed (not really pitched) the contemporary paranormal series -- which would not be right for Luna but would be for HQN (I have giddy dreams of an auction). My agent asked my Berkley editor "didn't she just love it." Cringe. My editor said yes, but not in a real enthusiastic way -- however, I've never seen her incredibly enthusiastic, and I DO know that she doesn't lie to me. So, I'm torn about the reaction, and being neurotic as usual. I'm beat. Want to cool down with a bath in my own tub, then hit the sack again since we got up at 3:45 (and I got to sleep at 1:00 am). Oh, the novella I judged to be the best, won. For reasons unknown to me, this conference isn't emotionally satisfying and an incredible drain. I expect it to be a big drain of energy, but it's been even more so I haven't done as much. Maybe it's because my aunt Sylvia hurt her hip and had to go home and I feel like I need to be company to my Mom -- not really free to do what I want -- and Mom wouldn't like that I feel that way, but so it is. Saw many of the Blogsphere people yesterday and talked. The big thing was the Berkley signing (free books!) I picked up some I wanted and talked to people who knew my work as well as those just swooping down for free books. We were arranged alphabetically by first name (finally figured that one out) so I sat, as always, next to Rebecca York/Ruth Glick. Then there were the publishers' parties. I went to Berkley and spoke with my editor and made sure I was seen -- I don't "work" a room, but I can force myself to be more charming. When it got too hot and suffocating, I went with Christine Feehan and her daughters up to her suite and talked about business and the craziness of writing for a while, then back down to Berkley. Then I went to the Harlequin party where I danced some but had anticipated dancing all night. Maybe it wasn't enough "strokes" to my ego -- people I thought would remember me, didn't -- and is that an unrealistic expectation and big whine! So I left and came back and had a bite to eat and read a little and went to bed. Huh. And as long as I'm whining, I feel fat, too! Today, 2 editor appts., an author's focus group, and the RITA dinner/ceremony tonight. Maybe I'll look in on the seminars. Mom's gone for her early am walk and I want to go back to bed, but will probably read. I don't think I need to be anywhere for about 2 hours. Love to all, and sorry if this one was a downer -- this is a professional conference and obligation, and in that, part of a writer's life -- networking. I can't stress how important that is, but it sure is easier for me online than in person -- or maybe it's just that yesterday I spent in mobs as opposed to small groups, where I feel more at ease -- I think that's it. I haven't had enough small group time talking about business and writing -- so now I know what will make me feel better. Still think I'll go back to bed. Sorry, the Caesar's Palace network was down...until I called the tech guy who came up (walking to the end of a long, long, long hall) and hit my Mozilla icon and of course it came up. That can be SO irritating! wasn't expecting to win, and had JUST walked into the room from the Kiss of Death party as my category was called. I can tell you, if I hadn't been there, I'd never have heard the end of it. Ok, that was evening. My stomach was upset both before and after, and I had strange dreams. I spent the am with my Mom and looking at the shops, the afternoon was up at Tahoe with lunch with the Knight Agency. I spoke to Deidre of business and told her I'd have the Wretched Synopsis (and now revising chapter 3, too) to her within 2 weeks. Then, of course, I met my editor for Luna and she said she'd sent me the copy edits (deflagging in Luna terms), of Sorceress, and I, of course, want to tinker with the first 3 chapters some more. Urgh. 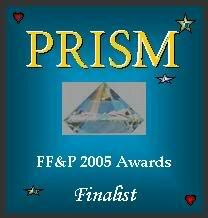 But I won the PRISM and met folks and talked to the Squires, then attended the Open Circle ceremony (which I like doing) and then the Midnight Madness bazar (far too late to see anything worth having). So, now you see that I don't write in chronological order...and if this was a book, I'd move the paragraphs around, so the reader wouldn't have to arrange my activities in chronological order in their head as they read (if my ramblings meant enough for them to care). This is another way to LOSE readers in genre fiction -- especially if you don't clue them in that you're jumping around. Stream of consciousness or literary fiction might be able to use this technique, but I think then they'd have to do it in a studied manner unlike myself. First I want to say that though I like to read short blog entries, and plan on mine being short and pithy and informative, it doesn't happen, and these conference ones may be worse. Didn't sleep the night before much, getting ready. KINKOS DIDN'T HAVE MY MOUNTED POSTER FOR THE SIGNING READY AND I HAD TO MAKE 2 TRIPS. SINCE THEY DIDN'T OFFER ME ANYTHING OFF FOR MY TROUBLE THIS IS MY ONLY SATISFACTION. VERY BIG PAIN. ATE UP MUCH TIME. 3:30 appointment with Matrice. Since I had a couple of questions from the other Luna authors about foreign sales – recent launch in France, upcoming launch in Italy, Germany next year, we talked about that first. Then we moved on to mass market. Time and again she mentioned different strategies they were pursuing to see which worked best for sales. They GRAPH results. I DID talk a little about me – the contemporary paranormal series I'm (still!) working on, when I should get the proposals in for the next three books (she thought there'd be 2 but I told her a secondary character walked on stage as a hero...). Being in an expansive mood for a Scorpio (usually I'm cadgy) I said I was still messing with the first three chapters of Sorceress and brought them to work on here. True. I know a lot of business stuff went into one ear and slithered away into the depths of my brain, never to be recalled. But I had a good chat and she stroked my ego a bit. Celtic Hearts get together: We're a tiny, new chapter, but they had pins and pens and a taco bar. I was allowed to bring aunt Sylvia and Mom and we talked books. Mom was pretty silent because she has hearing problems. It was a lovely time. That's all for now. Today I'm spending the am with Mom and aunt Sylvia and the pm at Tahoe with agent and her clients. PRISM AWARDS TONIGHT. WISH ME LUCK AS HEART DUEL IS UP FOR BEST FANTASY!!! Plotter / Pantzer / SCENE-ER? All right, as I looked around the table at critque on Saturday (there were 7 of us. One of my groups got down very low and we invited some other folks in and now have a large group). I noticed that we really fell into about 3 groups of differing plotting styles. Two of us are Scene-ers, writing a lot of scenes with a vague idea of how they come together, two of us are pantzers, writing scenes but also putting them in order and knowing in general how the book goes -- this group includes me -- and two of us are plotters, plotting ahead of time before writing the book. I haven't seen enough work from the last to categorize her. So, at least I don't feel as if I am on the bottom of the disorganizational ladder, and I admit I got a lot of help and comments on my synopsis, and "fixes" from those who plot better...my motivations are too subtle and complex (which made Sorceress of Faith a b**ch to write), my conflict between the h/h (hero and heroine) were also too subltle and complex, not all my ideas made it onto the page, and my hero was a Beta guy. So now I'll be doing stronger, simpler conflict/motivations, deeper backstory and longer explanations of my paranormal universe, and the guy will storm through the story as an alpha. At least in the synopsis. Yes, rewarding yourself is cool, but Awards are REALLY cool. And I got the first for Guardian of Honor already!! Hooray! (yes, this is the outside validation that is so dangerous for writers -- see a previous posting). But it's good to have a book win at least ONE award, and most contests I can enter Guardian in won't be judged until next year. And I didn't even know Guardian was up for an award, which makes it SWEEET. So, here it is, a Reviewer's Choice award from the Cataromance Group/Website, for best Luna of the first 1/2 of 2005! Cool. And since RWA starts this week and I won their RITA award, I'll talk a bit about that, too. Most RWA chapters who have contests give the winners pins to put on their badges. For the RITA, the National award, they give you silver ladies for finalling and golden ladies for winning. So, for me, RWA can be a real ego boost. I have 2 silver ladies and 1 golden. I have my Beacon lighthouse, and a couple of PRISMs. I have the oval circle for service to a chapter...yes, some of us (like Mary Jo Putney and Maggie Shayne -- who is up for THREE RITAs this year -- look like Generals and Admirals with their fruit salad). But, anyway, if you have those silver or gold ladies, you are usually treated pretty well by others. Like I said, an ego boost. After I won, I counted up how many people had RITAS. I think by now it is about 50+. Nora Roberts, I think, has more than 10. So in a conference of about 2,000 only 50+ people will be walking around with a golden lady on their badge/lapel. Cool. Yes, outside validation can be very sweet, especially after a week of spending $$$ on the plumber, miserable heat, knowing you don't get paid for the time you're away from the day job, waiting for a check from the agent -- which was mailed but hasn't arrived -- and the massacre of the pitiful synopsis. Sure, I'm going to enjoy it! Yes, I do. On a regular basis. Yesterday I rewarded myself with a cup of good assam tea in an exquisite paper thin cup...since I had to take down my china curio cabinet so the plumber could saw up my kitchen ceiling, I had, of course, to wash the Beleek which I haven't used for about four years when I rewarded myself this way last time. The Owens' women's curse is the love of fine china. The worst arguments my Mom, Grandma and I ever had were about china (I'm not kidding) and the VERY worst was about bone dishes **shudder. ** Not bone china, bone dishes, little dishes that hold chicken bones etc. We searched the d**n city (Mom and me) for years looking for the "right" antique bone dishes for Grandma. She was what one would call a Very Difficult Person (ok, very spoilt and self-absorbed). Anyway, I now have her Beleek and the reason I got to reward myself was for surviving the massacre of my poor pitiful synopsis in critique. It was a good thing no one wrote in red because each page would have bled to death (6 copies of 10 pages makes 60 bloody pages-- yes the double entendre is meant). Sigh. I'm a pantzer -- this is probably a rataionalization and an excuse, but it's also a fact. The story comes to me when I write. Thinking it up ahead of time is just plain hideous for me. So, yeah, I get a reward for getting the thing together in even pitiful shape (so I forgot the climax, so what! it's in my head, ain't it -- like a lot of things, I found out), and a big reward for taking it to critique. We only had two other people reading and their stuff was perfect. Sigh. Where's that banging the head on the desk icon when you need it? Sorry, folks, I was up at 5:45 am but Comcast wasn't. :( Denver had an outage that wasn't fixed before I had to leave for my in-person critique group -- and, yes, you will hear stuff about critique group again this month tomorrow. Plumber is here fixing 2 leaks from the tub and coping with wasps who found a way in to nest...eeeek! 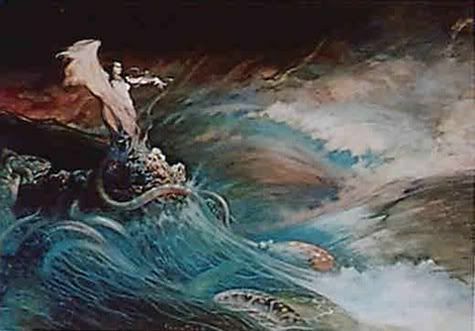 Regarding the cover art for Sorceress of Faith, I must admit I was thinking more like something above, Frank Frazetta’s Sea Witch. I have a print on an old calendar somewhere of this one. Images DO stick with me. In fact, like I said before, most of my inspiration comes from physical objects (I’m tactile), but visual will do just fine. I had this image in the back of my mind when I wrote Sorceress and the “land that calls to her” is by the sea and when she raises her Tower (the last thing a Circlet must do to prove they’re adept), she feels sea spray. Anyway I have ideas for Knight Protector and will be sending that art later…mostly Ciro Marchetti’s Knights in his Gilded Tarot and Dream Tarot, and Nene Thomas’ Carousel Horses (I have the brown print and love it). Art sheets (description of the books for the art department so they can develop the cover) are due about a year in advance -- so you should start visualizing your book asap. I've made "covers" of my own -- both for myself and the art department (mostly for Berkley). This is "creative fun" that I do. Since I've received a few questions about the "tarot" cards I used in HeartMate, I've been making the cards I mentioned in that book. I am quite an amateur, but, again, this is my fun. Heroine is tall and voluptuous, Rubenesque, (i.e. plump/overweight) Auburn hair, blue eyes. On earth she has a broomstick dress in the beginning, a “little black dress” for a formal reception, and a blue pantsuit for travelling. In Lladrana she’ll wear a loose robe/gown made of heavy velvet. As an apprentice she has a jewel-toned gown (deep red/blue/green) with little yellow birds embroidered on it. As a journeywoman, she will be wearing a velvet gown with a large yellow birds around the hem and sleeve ends and on each shoulder. As an Adept, she will wear midnight blue gowns and her heraldic symbol will be a pointed-arch doorway with black inside and a silver/gold starburst in the middle. She could hold a “crystal” ball of of one of those plastic balls with her sidekick hamster inside (attached photos), or she could have her hamster riding on her shoulder. Note, she will also have a palm/pda in Lladrana. She has a dark rosewood staff inlaid with twining leaves nearly as tall as she is and the color of her hair. The staffs are somewhat like those Ciro Marchetti uses in his tarot decks (Dream Tarot/Gilded Tarot) http://www.ciromarchetti.com Marian will be able to command the weather, so if you want to do a long staff with “weather” stuff on it (clouds/lightning bolts) that would be fine. Maybe steam could rise from the top – any colored. I haven’t visualized her Adept staff as yet, so I’ll take what you do or tell you what it looks like when I write it. In Lladrana she will be living in an old round tower on an island with a sorcerer I see as old and crotchety and looking like Ghandi. In Colorado, she is living in Boulder and attending the university and I am attaching photos of the Flatirons. Her apartment there is a garden level apartment…. As for my writing life, that's not exactly glamourous either. I've been adding stagnant paragraphs to the two synopses I've been writing for days...yes, there's great tension and drama in a critique buddy's writing life, but that shouldn't go public. Ever. I didn't get any contest entries to judge this year in the Colorado Gold (RMFW's contest), but I did send a note to the chair of the Golden Network contest who was looking for published judges in the paranormal category. Fan mail for Heart Choice is trickling in making me dance. I saw a so-so review and was bummed. Day job has taken a couple of good leaps as my supervisor had a good birthday and a woman who just beat cancer returned to the job (MAJOR CONGRATS BARB!). As a part of the Denver Bar effort (or maybe the ABA) we are collecting supplies for school children (reminding me I could cull out my stack of portfolios and donate). Family -- I haven't seen my Mom in a month, and haven't spoken much to her (yeah, I've always had a problem with split infinitives). My youngest brother was downsized and this is a major financial drain on the family. Mom doesn't bully me into family gatherings anymore since my writing is actually paying. She and my aunt Sylvia will be at RWA with me, Mom rooming with me (we travel together well unless I'm extremely frazzled and then Mom is wise enough to be serene and keep her mouth shut). I actually intended to talk about Pitching, or ISBNs in Publishing today, but so it goes. Is this blog too narrow in subject, too boring, too often updated, too rambling? Am I not sparkling and charming enough? Sometimes I can be charming...but I write this at the beginning of the day and that's not my best moment...as an excuse, that's pretty poor, but I'm sticking with it. I am vey much anticipating the trip to Tahoe with Deidre Knight, the Harlequin party where I'm supposed to wear my favorite outfit (I'm wearing a lovely colorful pajama outfit that I've signed in before but it's not natural fabric and I don't know how it will stand up to four hours of dancing. I'd like to do a pedicure, but I've never painted my toenails in my life and the idea of having an Asian woman who speaks no English down on the mall do them is intimidating -- and how long does that take, anyway? Could I do it over lunch? I often eat lunch at my desk). So that's my life as I sit her in the very dim light of my office -- blown by the fan set on high as it was all night -- and looking next door at Charlie's red brick and white bow-window stairwell and branches of my trees dappled with pretty yellow sunlight that will turn white fierce later today. Plumbers. Ick. Yes, this is my weak point at the start of any book. Usually the plot comes along. However, in a brief plotting session like I did with my friends on Heart Choice http://robindowens.com/images/HeartChoicePlotting.pdf , one of the best things you can do is have everyone write down twenty things that might happen in your book. This will give you ideas outside your own head. I DID use some of them... But even in the beginning of a plot and a buddy advises something that just doesn't feel right, I don't use it -- I think internally when we start a book we have a general idea how it can go, no matter how unformed. We were discussing this in another forum and the Very Best Editing is when something bothers an editor s/he asks "Why is s/he doing this?" "Where are you going with this?" etc., questions that don't limit the author, but makes them think about their work, delve deeper. HEART CHOICE IS BOOK OF THE WEEK AT BERKLEY AUTHORS! Here's a post from Deidre -- copied from her Blog. Yes, it’s true, and while I’m being tongue-in-cheek with my title on this blog entry, the truth is very serious, and I would appreciate all my loyal blog readers spreading the word. The story has gotten back to me through my fellow agent and friend, Roberta Brown, who heard about the situation from some of her clients. Apparently about three weeks ago someone claiming to be me sent a blanket email to roughly forty e-pub authors offering representation to anyone who was interested, “guaranteeing” a sale in NYC and claiming to charge only 10%. This is VERY serious business. Any of you who frequent this blog can imagine my take on this email—I believe some scam artist has decided to target writers and possibly charge fees or perhaps it’s someone wishing to discredit me. Something like this bothers me on many levels. First of all, this is my reputation that it calls into question. So whoever tried this scam should know I plan to take legal action and pursue this to the fullest extent possible if it happens again. Second, the obvious use of my name to potentially take advantage of authors really galls me (obviously). Lastly, the implication that someone got so pissed at me, probably via a rejection, that they decided to try and blacken my reputation is equally annoying. However, all of that is totally tolerable because of one thing—I know my reputation speaks for itself. Please would you guys who blog link to this blog with a warning note—that if anyone is receiving blanket offers of representation from our agency or anyone claiming to be with our agency, to forward it to me at Deidre.Knight@knightagency.net. Still thinking about Harry Potter. I would say that Ms. Rowling is not having much editing done for her at her publishing house. They trust her. And that's a lovely place to be in, but I've seen several authors who are trusted, in my opinion, too much and NEED editing. I'm not sure when writing buddies/critique groups started, but I DO know that if I'd have tried to have used the sketchy motivation that Rowling did in one of my books, my editors (and my friends so it might not have reached my editors) would have nailed me for it. And since Rowling writes fantasy, she could have worked her way around the motivation with a fantasy fix like an Unbreakable Vow -- or how I used my broken Vows of Honor. Since Heart Duel, I've had a household living under a couple who have broken their solumn Vows of Honor -- their health is deteriorating, they are aging at a more rapid rate, the morale of the whole family is low...and I am thinking it causes even more pain and anxiety in Heart Quest. These sort of things can be done in fantasy. Writing fantasy, you must stick to your Rules of Magic -- whatever you set up in the beginning -- still, I think that the Rules of Magic always deepen and grow with every book, and if you have a mind flexible enough, you can write yourself out of a corner. I also think that what Ms. Rowling has set up to be done -- if it must be done by Harry alone -- is impossible to wrap up in one book -- or it would be for me, so seeing how she'll do this will be interesting. Yes, like many people. I spent yesterday reading Harry Potter and the Half-Blood Prince to the detriment of my writing. Normally, I WON'T critique books here. I do that with my friends, but I don't do it in a public forum like this and I will never "review" books on any site where you have to assign points -- stars, hearts, arrows, angels, crystal balls **shudder*. But I'm pretty sure that J.K. Rowling will never see this. She is so HUGE and British and confident and involved in her family and writing that I don't get the idea that she surfs. I thought the minor plot thread about who was the half-blood prince interesting. I guessed right, then followed a couple of red herrings she ran and guessed wrong, and she is EXCELLENT in setting up her red herrings. I liked the romances. I thought they proceeded as they should. I liked the quiddich matches. I liked Harry, Hermione, Ron and liked/disliked other characters as Rowling would have wanted me to. But, as far as I'm concerned the motivation of one of her characters was not well done. I didn't believe it and, worse, I didn't get it. When you have to go back and re-read passages because the motivation isn't clear, the author hasn't done their job. I was left with a big "DUH?" And until this book has been out for some time, I won't discuss this. But, for me, she failed in her motivation, unless there is something more than I saw in this book. She left dangling threads, and since that's what this series is all about, I accept it. One was very delicious. But, all in all, I was disappointed because I didn't get WHY, and, again, if you don't leave your readers satisfied you can lose them. Not Rowling, but definitely Owens. So I'd better go write. I will say she's a wonderful storyteller and I envy that her plots come to her so easily and smoothly and intricately. 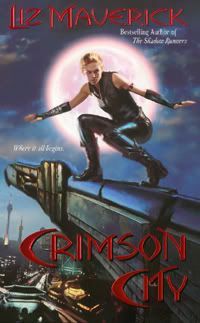 Shared worlds -- Crimson City by Liz Maverick! This is the second "shared world" series that Lovespell has done. Last year Susan Grant (also of this group) created the 2176 series and wrote the beginning and ending book. "Continuity series" are done fairly often in the Silhouette/Harlequin lines -- mysteries, suspenses, some hot storeis, and short stories of shared worlds were very popular in science fiction and fantasy (sf/f). The most popular was, I believe, Thieves World. Since Lunas are "big" books, I haven't been invited to do a continuity series, but I've heard of them from two of my good writing buddies. I know that they can be very difficult to write! Once, this was the City of Angels. The angels are no longer in charge. From the extravagant appetites of the vampire world above, to the gritty defiance of the werewolves below, the specter of darkness lives around every corner, the hope of paradise in every heart. All walk freely with humans in a tentative peace, but to live in Los Angeles is to balance on the edge of a knife. One woman knows better than most that death lurks here in nights of bliss or hails of UV bullets. She’s about to be tested, to taste true thirst. She’s about to regain the power she’s long been denied. And Fleur Dumont is about to meet the one man who may understand her: a tormented protector who’s lost his way and all he loved. Theirs is one tale of many. This is Crimson City, where desire meets danger and more than just the stars come out at night. All right. I know Free Your Artist at my website is having problems. I have a webmistress, and when I do work, I forward to her, and she puts it up. Heaven knows what I might have had in my post that might look like html and freak the thing out....anyway selling my first book caught me a little off guard. I didn't have the Robin Owens.com locked up and though I offered for it from the person who had it, he didn't get back to me in what I considered a timely fashion (a couple of months). I do have it now, but since the website wasn't available I asked my editor to put Robin D. Owens on the books, since robindowens.com was available. If you're a prospective author or author, do you need a website? YES!!! I consider my website one of my best investments (and I invest in it every month with my imagination, money and time -- and the last is important to me). It lets readers see what's coming up, and, I hope, it gives extra value in the Free Your Artist Page, fun links, and the Worlds page where I put up additional imformation regarding my books. For new readers or people I meet that I actually hand cards (wallet calendars) to, it's easy for me to say -- "There are excerpts of my work on my website. Try before you buy!" That way I don't always have to be at the top of my form and pitch my books or series when I'm walking dead in the elevator at the day job. I literally was in the process of uploading a three page site that I'd made myself when I sold. True story. But I knew that though I could learn html etc. I would rather spend my time writing and wanted a really professional looking site. I think I looked at every author's website on writerspace and sff.net and I'd admired the late, great Moira's web jewels for a long time. I LOVED dark pages. But I didn't care for dark pages and light writing -- as you can tell by my website and this blog, the "parchment" type deal was a way to get around this. I bought the graphics for my website, so you won't find any other page on the web that looks like it. I've had other people ask to use the set up of "Free Your Artist," and said that's fine if you gave me credit for the format and link. With the Artist's Archives I now have about 100 pages on my site. Like this blog, I think offering a variety of information is Good Value to readers (and here, writers). I also think that since I write futuristic/fantasy, many of my readers are technologically advanced and internet friendly, so it's a place for them to go. All right, the brain is truly mush this morning, so I'll spare you and me any more of my ramblings -- and yes, I usually DO revise the blog a few times before I post. Not today, my eyes feel like they've been rolled in sand and some heavy duty thinking, writing, plotting calls. Creativity Exercise/Plotting Workshop Notes. July Website Update! Yes, you WILL have to put up with this every month after my website is updated. But like this blog, I TRY VERY HARD TO HAVE SOMETHING NEW AND FUN FOR READERS AND WRITERS. CONTEST: This month is for a 3” cedar heart-shaped wooden box. As usual I have a quote from my current book -- Heart Choice – that may be a bit of a spoiler this month. http://www.robindowens.com ENTRY IS THROUGH A POP-UP WINDOW. Take a look at my Free Your Artist: This month’s creativity exercise deals with the Sun, and naturally I have some fun links. PLOTTING WORKSHOP FOR HEART CHOICE: I’ll probably talk about Plotting Workshops for the rest of the week. Here’s a result of the workshop for Heart Choice. If you’ve read the book, I think you’ll find some surprises! 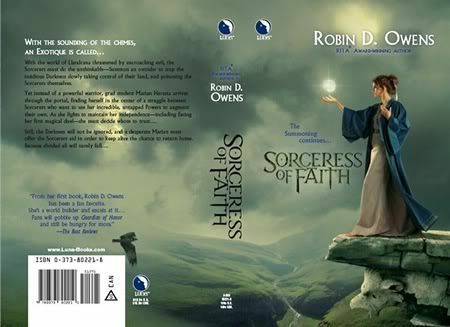 COVER FOR SORCERESS OF FAITH UP! And I really think it’s the most beautiful cover I’ve ever had. Of course, I’m going to have to rewrite her clothes and the scene and Marian’s not really “rubenesque” as I requested, but still, as a piece of art, it’s breathtaking. But I had a question about beginning sentences with gerunds. Apparently some people don't think it should be done. I do it regularly and with intent. What IS important, I believe, is varrying your paragraphs. Do the last five start with subject/verb? Then go back and change one to a gerund, or think how else they might start. Actually, this is one techinque I work on all the time as I write. The only thing to watch is whether your character ends up doing two things at the same time that can't be done. "Weaving through traffic, he talked on his cell phone). Ok, that can be done but SHOULDN'T. Major pet peeve of mine -- probably since someone drifted into my lane (oncoming!) yesterday. But, as far as I'm concerned. "Running through the woods, she pulled a hankie from her pocket" sounds ok.
Oh, and watch how many lines your paragraphs have, too, make sure it's not all 4 1/2, 4 1/2, 4 1/2, the rhythm gets static -- boring. THIS IS LATE MONDAY AND TUESDAY'S BLOG!! Big Time is making USA Today or NY Times lists. 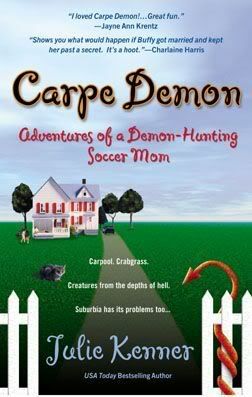 OR, like Julie Kenner of the wonderful Carpe Demon, Adventures of a Demon-Hunting Soccer Mom, being OPTIONED FOR A MOVE!! Is that cool, or what? Julie herself, is a lovely (and interesting) person. Now Kate has to clean up the mess in her kitchen, dispose of a dead demon, and pull together a dinner party that will get her husband elected to County Attorney-all without arousing her family's suspicion. Worse yet, it seems the dead demon didn't come alone. He was accompanied by a High Demon named Goramesh who, for some unknown reason, intends to kill off the entire population of San Diablo. 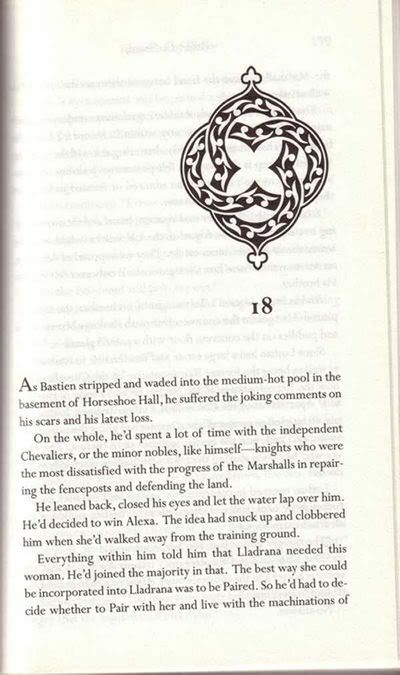 All right, one thing that a publisher can do to add a little interest to a book is Chapter Graphics -- a little drawing/graphic at the beginning of the chapter. Today I'll go with my Luna book, Guardian of Honor. Luna Books has been incredible in adding a special graphic at the beginning of each Chapter to distinguish the book. See above for Guardian of Honor. It's a nice touch that all the authors appreciate, and we hope readers do, too -- and other instances are: the line-drawing of a Fairy Godmother wielding a wand for Mercedes Lackey's Fairy Godmother, and the symbol on the banner (designed by author Michele Hauf) for Seraphim. I had no idea what they'd use for Guardian of Honor, but I was pleased, and didn't see it until I got the book! I did some good work on Knight Protector yesterday, the third in the Luna series, the proposal for which is due, like, immediately. Fortunately I only need to write chapters, not a synopsis (which, for a 3 book deal, I already wrote when I submitted it originally). And since these stories have been in my head for a long time, I know where it's going -- though the hero, Marrec, is showing unexpected depth and character traits which is what is so fun about writing! I was also posting on a motivational seminar every day last week, called Ask An Author, so I had a busy time of it. This Saturday I have a Reading and Speaking at DASFA (Denver Area Science Fiction Association). I think I'll do Guardian of Honor again (gotta find my special reading copy, more later). ANYWAY, writers have trouble with motivaton all the time, so I've developed some crutches-- uh -- techniques to help, and that was what I was talking about last week. Does writing make you feel better? If you were offered $10 million to never write again (including journalling, because I sometimes work out a story when journalling), could you take the money and not break your word? If you knew you would never be published (again), would you continue to write? I answer YES, NO, YES, if you do, too, then welcome to the world of writing, and may all your writing dreams come true. Of course I pay attention to feedback, whether in email or online. The most luscious is the "I love the books" the sighs are "write faster." Some readers ask questions, and if I feel of a mind, I answer. Some readers offer suggestions – "Heart" book titles, plot lines, what should happen...and I listen to those, too, and file them away. So I think about this comment and wonder and I just don't get it. Huh. something to the books I don't know about, or TAKING something unique to her from my books. And that's pretty cool. I truly believe that what I put out as a book is something that the reader also experiences in unique ways. People will see different things, enjoy different moments. Like my style or not. But reading shouldn't be a static experience, but an interaction between the writer and the reader. And that's what I love about being published. Yes, I would still write if I weren't published or would never be published again, but having people hold the book in their hands and minds and react and enjoy or object to my storylines is just incredible to me. WE make the book what it is. And that's my philosophy for today. I've been thinking a lot about the philosophy of creators since I watched Firefly and listened to the commentary of Joss Whedon on Objects in Space (I borrowed it from a friend but have since bought my own set new). When he spoke about what he was doing in that episode, I thought, "Yeah, so?" Then I worried that I didn't get it. I'm not sure if I did get his point. Since I think about what he was saying – objects in space – pretty often, it is commonplace to me, or if I missed the point altogether. So, he put that episode out and had a point he wanted to make. I have themes I like to explore, but I don't think I want people to see just one thing in my books. Huh. (And that’s the rule of three...if you want to emphasize a word or phrase, use it three times). Yes, it can happen. My editor at Berkley has picked up a couple of epublished authors who have gone on to make it BIG! Angela Knight, as I said before, and Mary Janice Davidson. But you need to know your craft and have a unique twist or voice. I read Mary Janice in epub and especially like the Wyndham werewolves, but her Undead series is HOT. But Betsy's "life" takes an interesting turn at a baby shower for her wicked stepmother, who lets it slip that Betsy has a long-last half sister. Now twenty years old, this woman just so happens to be the devil's daughter...and destined to rule the world. YES! If you're aiming for a big NY publishing house. If you're aiming at small press publishing or epublishing, this is different, you don't need an agent. 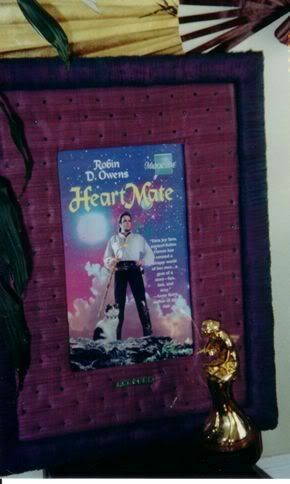 It might not have been so even a few years ago (and yes, I sold HeartMate without an agent. At that time I was between agents), but I KNOW an agent would have gotten me more money and perhaps a quicker sale for Heart Thief than I did myself. Those are two reasons to have an agent. A third is that they will negotiate and you can write (but always ask questions and ALWAYS read contracts). A fourth reason is that they are usually better connected to the publishers, know what's going on, what's coming out, than an author is. Also, more and mor publishers are corporate conglomorations, and don't take unagented material. And yes, getting a good agent can be as difficult as getting your first book published. I am now on my third. AND, A BAD AGENT IS WORSE THAN NO AGENT AT ALL. Also, I advise that your agent be a member of the Association of Author Representatives, which has a code of ethics. Because anyone can be an agent. You could print up some business cards, send a few emails and have stacks of manuscripts on your desk by the end of the week. There is no licensing for agents. So stick with someone who has signed a Code of Ethics. Talk to their authors (and they should be touting their authors), look at their websites. Yes, I have a baby namer book. There are also a lot of baby name sites up (just looked last night and used http://www.babynames.com) where you can put in a meaning and get a name. For contemporary books, you can put in a date and see what the census or public social security data base said were the most popular names for that year. Or, if you write fantasy, you can choose a language and make them up. For my Celta series, I am VERY strict with myself. The characters are named after plants -- the 13 Great Houses are the Celtic months of the year, the 25 FirstFamilies are the Ogham alphabet, and I use those names for heir (male or female) of the House, with the exception of Holly. For members of a lesser house, I'll look at my "herbal tarot" and pick some characteristics and use the name. Yeldoc, a Bailiff for SupremeJudge Ailim D'SilverFir, came from the 2 of pentacles, Yellow Dock. So did Goldenseal, Sage, etc. For lesser family members of a clan, I'll look under a plant book name for different plants under that family and use names from there...Bucus Elder was from Sambucus...and sometimes the Latin names are cool, sometimes not. Melissa is Latin for Lemon Balm....I also have a handy Welsh dictionary -- hey, the name is Owens -- that I might throw in a word or two that I've modified or not. For the Lladrana series, I use French, again modifying the words or names. Marrec Guardpointe (I think that's the next hero up, LOL) came from French words I wanted to use. This was mostly because Bastien, as a hero, came to me first and his name is French. Anyway, there I was on the Ute Rolls and saw several with the last name of Ice. Is that cool or what (snicker). I don't recall ever reading about a hero with the last name of Ice, and this will be pretty fine for my guy. I wanted his first name to be Garrett, but that means "to watch" which I'll have to think about. Garrick, "Leads By The Spear", is better. And I checked the rolls, and there were plenty of English, French, etc. given names...in fact, the oldest man on the rolls (born in the 1850s I think) was a Charles -- probably his "white" name, but maybe not. I have more research to do on the culture, too. So I'm nearly set. Hope this was some help. 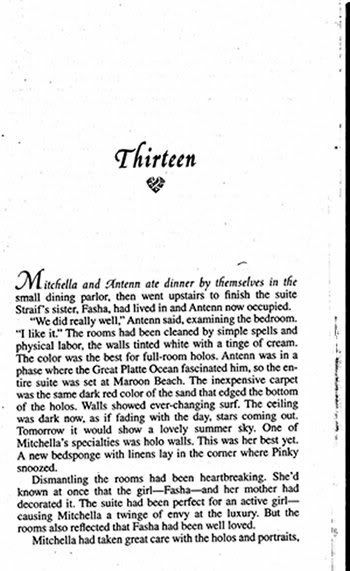 Yes, this IS a real scanned page of Heart Choice, which means a tiny, teasing excerpt. HEART CHOICE is OUT TOMORROW, please support this writer who wants to quit her day job and still be able to feed herself and Cats (and Cats are, naturally, finicky and demanding). COVER IS FAR RIGHT ABOVE. Do I need to talk about sell through? All right, a very brief note about manuscript format. This is old fashioned (to play it safe) and for NY Publishing houses. First, margins 1 inch all around. Header should include your name on the left, the title of the book on the right (I've seen these switched) and page number in the upper right hand corner. Use a non-proportional font Courier is a Non-proportional font, the "l" takes as much space as an "m." Times New Roman or this font (Georgia) are proportional fonts, an "l" takes less space than an "m."
Double-space and get approx 25 lines per page. This lets an editor "eyeball" the page and determine approximate word count of the ms. and how much paper it will use. Figure word count as 250 per page, don't go by your computer word count. MY PET PEEVE -- do NOT single space between sentences. DOUBLE SPACE BETWEEN SENTENCES. Why? I've developed an eye disorder, my eyes don't track smoothly, but in jerks. This may affect my peeve, but the double space lets the mind know the sentence is done. It gives the eyes a little break, is easier on them (and yes, this html stuff on blogs is hell, I put in double spaces and it single spaces), and, again, plays slightly into word count. I think I've covered the bases. Use dark ink and white paper. Widows and orphans are ok (widows are 1 line of a paragraph at the top of the next page, orphans are 1 word). And, again, I think wordperfect the best word processor out there for writers -- it has limitations (at least WP 10 which I have now, and 11, which I uninstalled due to printing problems), but for FORMATTING it is wonderful. You hit "Reveal Codes" and see everything in the document (like "edit html" here). Ever spend hours cleaning up Word documents because something funky is going on and you can't find it? Ever give up? I use word at the dayjob and I've done both. And transferring WP to Word is truly hideous...stick to .rtf. Sometimes when I'm sick of my home office and my place itself (dining room table), I take my laptop out and write, revise somewhere else. My favorite is a local coffee shop in walking distance. Recently I went to a Barnes and Noble, too, which had tables set up, a new tea place (surprisingly expensive for the day) and, of course, the library -- though last time I was at a library it was a Saturday afternoon and too noisy with a loud, boistrous librarian. The courthouse during jury duty was not a great success last month, but I CAN write on planes and in airports (when I'm not flying with people who think that's rude). Short moral of the story, if the muse isn't coming, go somewhere else. Or if you ARE somewhere else, write on the run. http://www.robindowens.com/freeyourartist.htm and, no, I haven't updated my website for July yet. Probably done by the end of the week. So give it a try, see if there's something about your writing that was bothering you, some new flight of fancy that emerges, or if you just feel better after having let those grumpy thoughts out (and Ms. Cameron advises 3 pages because you wander around for about 1 1/2 before what's really bothering you comes out). I knew and read Angela Knight when she started her career in e-books. I wrote a fan mail for one of her Secrets stories (all excellent) and was excited when Red Sage chose her to be their first published novelist, and REALLY excited when she sold to my house, Berkley. There are some ideas that are, quite simply, unique, and because they are, they sell like hotcakes. Angela's new series is like this -- Merlin as an alien, hoping to save Earth and making the Knights of the Round Table vampires and the Ladies witches...simply unique, and, naturally, I wish I'd thought of it first. OTOH, I've never been able to wrap my mind around vampires or think of a new take on them. Like many women, I just READ them. Diana London is city administrator of Verdaville, S.C. She's also a werewolf who helps out the chronically shorthanded Verdaville Police Department by moonlighting as a police K-9. But even Diana starts wondering if she's bitten off more than she can chew when a serial killer comes to Verdaville. This particular killer isn't your average psycho - she's a vampire sorcerer who kills men to power her black magic.